This week I have been playing with my first DSLR, a Canon 40d, thanks to my friend David. Up until now my Nikon Coolpix 100 has served me well, and it’s taken amazing photographs considering it’s “only a point and shoot”. But I needed additional capabilities. The Nikon D300 I want is going to run me around $1,300, so until I save my hard earned dollars to splurge on that, David is allowing me to use his Canon. There are several people within our circle of friends who love photography as well, so David had the idea of starting sort of a “fan page” on Facebook for us to post our work. The page became “Sunny 16 Club”. (Sunny 16 being a term to describe the right aperture to use on bright sunny days.) It’s a good opportunity for us to share work and inspire each other. One of my favorite things to do right now is go on photo walks. Last night David and I hit up the marina in Bellingham in search of subjects during the “golden hour”. I was looking for rust, he was looking for still water and perfect skylines. This picture is of the bow of a ship I found towards the end of the walk. 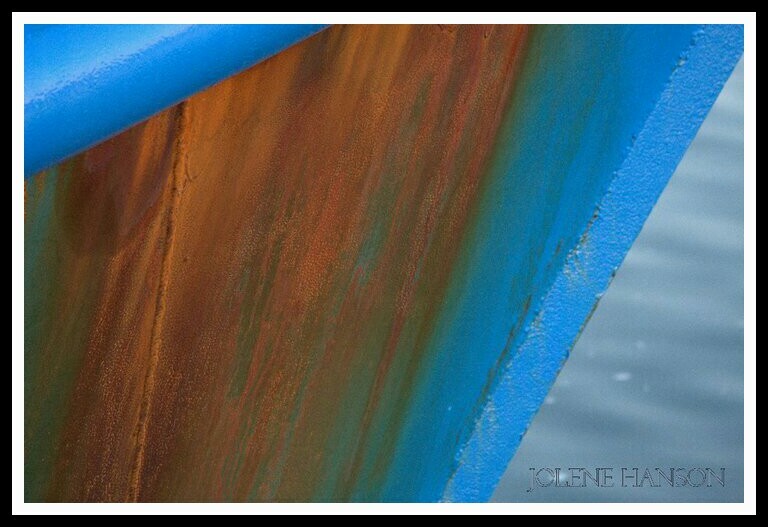 I loved how the rust seemed to form an abstract painting within these bright blue boundaries. I had fun waking around the marina. Here’s a post of one of the pictures I took that night. looks like I can’t use HTML tags…lol! Yes, there’s a fine line between addition/love with photography! I used to avoid sharing work because I thought I would inadvertantly copy other ideas, and then my work wouldn’t be original. But, I agree that it actually ends up being a challenge, and we all find something very unique about the same subjects anyway. So, I am loving the club! Ah, photography; it can be an expensive addiction love.